I have been making a case for 'traveling light' and only taking a carry-on for all trips which are for 7 days or less. I have not been successful in converting my friends or family but I am hoping my readers will see my point better. You'll look stylish during your travels (check my post here), and have everything you require plus love the ease. You’ll embrace the simplicity. You really don’t need that much crap when you travel. How many times have you gone away and only worn a handful of items while everything else just took up space in your bag? Becoming a more minimalist packer provides a respite from all of our consumerist habits. Plus, it’ll make getting dressed in the morning an absolute breeze. Ease of transportation. 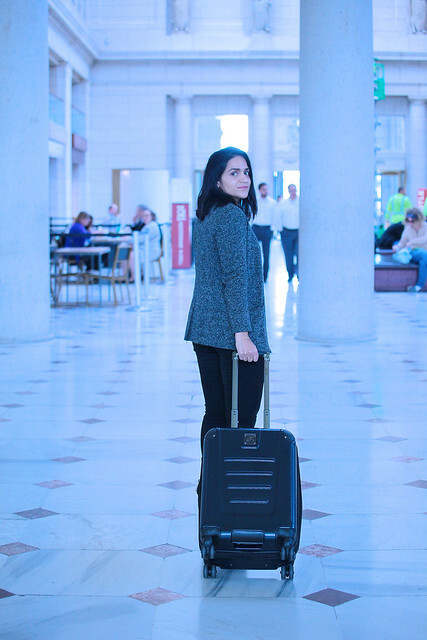 You’re much more mobile if you just have a carry-on, making it easy to get around. Getting on a crowded train, bus, or subway in a new city is stressful enough without having to haul a ton of luggage. Having one bag can also save oodles of money as taking local transportation to and from the airport is more feasible and the cash you save on taxis can be put to better use on your travels. Less hassle at the airport. Airports can be miserable places at times. Long lines, disgruntled personnel, and overpriced food. Bringing carry-on only alleviates a lot of the stress brought on by airports; get your boarding pass in advance so you can just walk to your gate without the hassle of dropping off your luggage; if you have layovers in the US, you won’t have to pick up your luggage and recheck it again, which is a major time and sanity saver if you have a short stop before your connecting flight; and you’ll never worry about your bags being lost in transit again! Easier to keep track of. Having one manageable bag is easier to keep an eye on when you’re en route to your accommodation or heading back to the airport. If you’re on a crowded subway during rush hour or walking through a busy street to find your hotel, holding one bag securely will be less risky than trying to manage several, especially if you’re traveling somewhere with high levels of petty theft. Also, you won’t be immediately pegged as a tourist than if you’re schlepping around several wheelie bags. No waiting for bags. This is my favorite carry-on only advantage. Don’t waste your prime travel time standing around a conveyer belt hoping that you’re bag will be in the next round. It’s a fantastic feeling to jump off the plane and bypass all of those suckers waiting for their luggage. Beat the rush to exit the airport and get on with your travels sooner than everyone else. I hope I have convinced you to give it a try. Start with a long weekend trip and then challenge yourself for a week-long getaway. Once you start you will only wanna check-in your bags under duress. Haha! 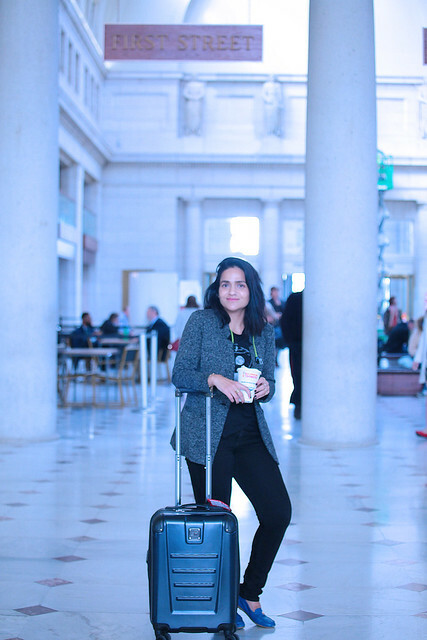 Location - Union Station, D.C. Totally agree! I always travel with carry on only when I'm travelling alone. Sadly when going away with the kids this is impossible as they need so much stuff! I always travel with a carry on. It helps me keep my packing light overall so I don't have to spend as much on the fees for storing luggage. If I can help it, I like to only travel with a carry-on! It makes the whole airport process so much easier! Not sure how often I will get to do that now that I have kids, but we shall see! I wish I could travel with only a carry-on for longer than like 2 days...I'm a terrible packer! This is what my parents do when they travel!! Such good tips! I'm just the same. I always just do hand luggage. In summer it's all you need. I might struggle with a winter wardrobe for more than a couple of nights though. I don't travel very often, but when I do, I always travel with a carry on. OMG I totally agree with this. I used to travel with a check-in luggage and now, it's so much more convenient and faster to just travel with a carry-on. Cheaper too! Very nice tip! I always have only hand luggage if I don't travel with my bicycle. If travel with it I go for non-standart luggage. Good news: it is always faster than regular luggage somehow. Traveling with a carry-on is so much easier than checking a bag! My issue is fitting enough in it! I love traveling carry on only! I just have to remember to be conscious of the liquids. Spring/Summer travel is also easier. carry on is always the best option. Less hassle, more room for travel! Totally agree. The carry on bags to travel on shorter trips are such a blessing. No waiting at the luggage belts, lesser things to carry and you enjoy better. Great tips!! I haven't brought a carry-on since a few months ago when there wasn't room when I got on so I had to put it 20 rows behind me and wait for everyone to get off - I will definitely try it again thanks to these tips! Great reasons and tips for traveling with a carry-on. I think keeping things to a minimum really helps to simplify the travel. I love when I can fit all my travel belongings into a carry-on! Makes traveling some much easier; especially when traveling with kids! 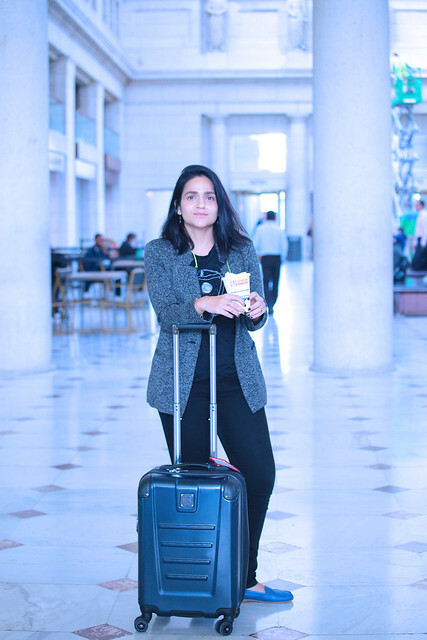 Between a carry on, and my purse, I usually can travel without having to pack a large suitcase. So much easier getting through the airport, in and out of cars, and takes up less space in your hotel room! I'm definitely going to give this a try next time I am flying solo or just with my husband. I don't think I can get away with it when flying with the kids - I always end up carrying some of their stuff in my case or carry on! I am a checked bag kind of gal all the way. I do like to use a carry on though on trips with lots of airplanes/trains etc because it is just so much easier. Also much easier in the summertime with dresses and sandals in there instead of coats and boots! I agree. I always travel with just a carry on unless I'm going away for a while. I just hate waiting for baggage! We just went to Mexico for a week with only carry ons! So much easier to deal with customs and security lines! This is some really great advice. Even though I have never travelled by plane before, I have tons of friends that travel for work and I will pass this on! I always have a carry-on when I travel. I like to keep my more expensive hair tools, makeup and a change of clothes with me. I can’t do it lol. I’m a chronic OVER packer!!!! I learned real fast that traveling with a carry on is cheaper and convenient. I love a carryon so I can avoid all the hassle at baggage claim! Plus, I know that my stuff isn't being tossed around. I need to start using just a carryon if possible more often! Such an easier way to travel. Great post. I totally agree with the whole carry on only thing. I use to only use a carry on but then I has my daughter and carrying light is no longer an option lol. I would honestly be lost without my carry on, I need all my flight essentials with me always. All about it! Literally only check a bag once a year and that's for Fashion Week! I so agree with this and try to take just a carry-on when I can! It's just so much more convenient! I love these tips! I need to start doing this. I just discovered how much I can fit in my carry on lol!